Once your fundraiser has ended, you'll want to decide on the future of your fundraising page. End dates or fundraising goals are simply visual displays on your page. Passing your end date or your goal will not end your fundraiser. If you would like to still accept donations on your page, you can simply leave the page as is. 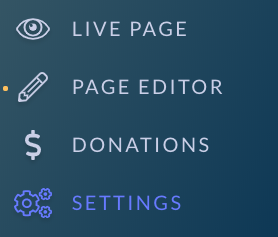 However, if you would like for your page to stop accepting donations, you'll want to review these options. The first option you have is to simply turn off donations and hide your fundraiser. We highly recommend this option as opposed to Option 2. Deleting your fundraiser will delete all of your donor data and remove you as the owner of that page. To hide your fundraiser from any search engine on the platform, turn off "Discoverability"
Once you've hidden your fundraiser on the platform, select "Turn off Donations" to disable donations on your page. Once you have disabled those two options, donors will no longer be able to find your page on Mightycause and will no longer be able to donate on your fundraising page. If at any point you want to enable donations again, simply head back to your Settings and turn on these features. If you would like to completely delete your fundraiser from the platform, scroll to the bottom and select "Delete." A popup will open confirming your action. Please note that deleting will remove you as the owner of that page.